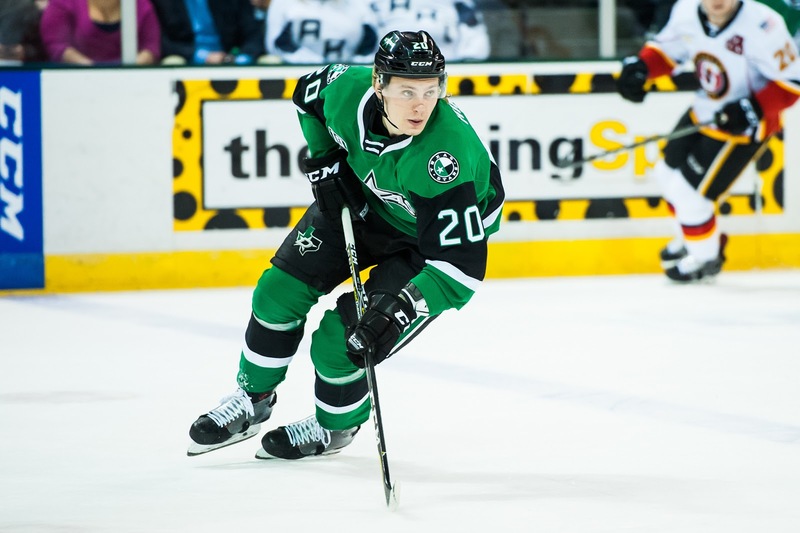 The Texas Stars were glad to be back in Cedar Park in a 5-4 win over the Stockton Heat that snapped a five-game losing streak. Recently sent to the AHL on conditioning assignments, Roope Hintz, Denis Gurianov, and Connor Carrick all scored for the Stars to help the cause. Adam Mascherin and Nic Caamano also tallied in the victory. The effort was certainly there for the Stars, and it led to some of the breaks and bounces that didn’t seem to come during the road skid. After goaltender Landon Bow stymied the unmarked Spencer Foo early in the game, the Stars came to life very quickly. They strung together a few positive offensive shifts and forced the Heat to ice the puck. Carrick cashed in on a slap shot from the point on the ensuing shift for his first goal with the AHL club. The lead was short-lived as the Stars committed a major hockey sin and allowed a goal on the following shift. Heat winger Buddy Robinson finished a 2-on-1 on a pretty feed from Tyler Graovac to silence the building. The Stars would go on to outshoot the Heat 8-3 in the frame as they got goals from Mascherin and Gurianov. Twelve minutes into the stanza, Andrew Mangiapane scored right after a Heat power play expired to knot the game up at two. Gurianov’s goal was the answer with a little over two minutes left before intermission. As he’s been known to do, Gurianov turned on the jets, beat the defense clean to the net and went backhand for the prettiest goal of the game. Hintz notched the primary assist on the play and made a good read to set up the Russian winger for the rush. Power forward Joel L’Esperance had a monster sequence near the eleven minute marker in the third period to help give the Stars a cushion. First, he forced a turnover on the penalty kill and nearly crammed home a shorthanded goal. Hintz stepped out of the penalty box seconds later, and L’Esperance found him on the breakaway to give the Stars a 4-2 lead. Another Heat forward, Andrew Mangipane, really made the home crowd sweat with his game-tying goal a minute and change later. Bow was caught out of position as he tried to play the puck and was just a little too late to thwart the redirect. The Stars are back at it on Saturday evening against the San Diego Gulls. The puck drops at 7:00 PM CST.